If I could just transfer my feelings to you when I finished devoured this book, you wouldn't be asking me anything anymore. Yeah, it's that good. Air Awakens earned my #1 spot for best reads of 2015! I actually did not want to go past 50% of Air Awakens because I didn't want to experience the pain of waiting for the next book, Fire Falling, which is stupid of me because I forgot I received Fire Falling early. 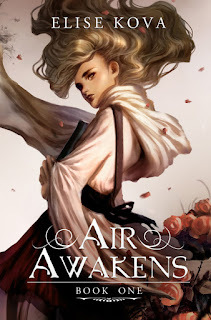 So, I read Air Awakens from the start again; I was too busy reading, gushing, squealing and flailing that I didn't notice it was way past my bedtime and it was getting creepier every minute-- dogs howling, birds chirping (at this hour?) and footsteps (no one was outside), but I could not put this book down! Every word was important that if I did not finish one chapter after another, I would get crazy thinking about what will happen. Heck, I am even getting crazy how will I write a review with my incoherent feelings and words. Do you think I care about that? No, brain. I suppose I thought it would be easy to talk about a book you loved because if you loved it so much, words would just keep flowing as you already know what you will say and you could talk about it for hours with your eyes glowing from all the happiness you felt and never get bored speaking of your adventures in even the littlest of things. But I do know what I felt. I'm very picky with fantasy books; it's like all or nothing with me. The reason would be is that fantasy has always been my narnia, my home and my escape. That said, I'm always in search for fantasies with high expectations. You know those types of books that deserve a whole box (because I don't have a shelf) just for that author and his/her books? Yeah, those. This book, Air Awakens, deserves it. I discovered Air Awakens through Michelle Madow and for that I am grateful! I wouldn't have know this masterpiece if not for her. "When will you stop being afraid, read, and learn more about who you are?" Vhalla is a great protagonist; proved that herself as the story progresses. I liked it when they told her what she was, she didn't immediately jump on the bandwagon like in most books. She was a young woman who's afraid and confused, but when there are times that she needed to be brave, she'll do it nonetheless. I loved that. That said, Vhalla's interactions, actions and feelings were realistic and believable. I mean, I would have reacted the same way too, you know. And bonus points for being a library apprentice and for reading books! "I may be a prince," he said as his lips brushed her ear lightly. "But I would trade it all to be a common man, even if only for tonight." I was both intrigued and attracted to Aldrik since their exchanges even though I haven't seen him yet, there was this some sort of pull to his writing that really made me like him and frustrated at the same time. And at their first meeting, I admit he was arrogant, mean and bad and hot, but then what came into my mind was that my love for Aldrik would be like the Darkling -- I don't care what he does. I'd still offer myself my heart to him. To the other characters, they are unique; they all have some traits in them that make you love them. Larel, Fritz and Prince Baldair... *sighs dreamily* It's also awesome to read that you don't have to recite a spell when they use their magic. I was worried for them! What if they recited the spell wrong and it backfires? All in all, I loved it that I finished reading Air Awakens at 4:03 am. I loved that I woke up high from reading that I didn't mind my brother scolding me for taking up most of the space on his bed that morning. I loved that I loved and enjoy Air Awakens that I don't even care if Elise Kova takes all of my stars. I'll even shower those stars at her. And. I. Meant. Every. Word. You should totally read Air Awakens. Seriously. Read it. I'm even trying to get my dog to read it. P.S. Can I have Larel please, Elise? Have you read a book that you stayed all night reading? What is it about?